The next gusher in productivity and profit will come not from technology replacing humans, but rather technology enabling humans to do work that to date hasn’t been economically viable. The shift should give companies a sharp rise in productivity, and will particularly help lift small businesses and sole proprietorships as they tap this reservoir of revenue. Technology has enabled the relentless eradication of inefficiencies in communication and financial markets. Communication has leapt from telegraph to telephone to fax machine to e-mail to blogs to micro-blogs to SMS. Stock trading has gone from gathering at the common places, to ticker tape, to phone orders, to online trading, to automated programmable trading. It should not be surprising that technology is catching up with the allocation and management of work at all levels of business with ever increasing granularity. The rise of machine automation of human tasks is in part tied to the cost-per-task efficiencies that are impossible for a human to perform in sufficient volume to earn a living wage. However, if even a tiny amount of required human judgment is required, it forces computer managed work to be either excruciatingly specific or to become economically infeasible to program. In the chasm between “computer-capable” and “requires a human” a massive amount of work is waiting for either the computer to get smarter or the human to get faster so that the price offered per-task will be profitable. There are examples of companies who employ both machine/technology and human judgment to tackle tasks in the Chasm. For example, it is a long-standing suspicion (although never proven) that Google employs real humans to vet search results, quality score ratings and landing page relevance. This combination of machine (or algorithm in Google’s case) and human create a scalable result that is also checked for accuracy. But what will it take to ignite large scale access to the waiting reservoir of economic value? Two things are necessary, one macro-economic, and the other is technology. If we took a page from eBay and brought millions of people who needed tasks done together with millions of those looking for assignments, we’d have one half of the world’s first WorkExchange. It would be a global switchboard that connects real and virtual teams on an as-needed basis in order to accomplish specific work. And just like a stock exchange, buyers and sellers would mutually benefit. In this case, those with work to offer would gain access to a broad reach of talent while those seeking work would be able to sell their talent to the highest bidder. We see examples of this, albeit in a less mature form. For example, technically savvy folks can sign up on a Microsoft digital bulletin board to deliver specific “how to” articles about the company’s treasure trove of product components. One couple sailed a 30-foot sailboat across the Pacific and actually paid for their journey by downloading and uploading documentation jobs from the bulletin board via satellite. Amazon’s Mechanical Turk offers an even broader application of a WorkExchange. A wide range of simple tasks are posted on “The Turk” and any online surfer can accept and complete the jobs for a defined fee. “The Turk” has been successful so far because the work is tightly defined and the descriptions of each task are light on subjectivity. For example: “Tag these 1,000 images with a color, setting and era.” And a little known fact is that 77% of the ‘Turkers’ reside in the United States. 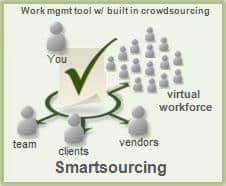 OnDemand Workforce and Crowdsourcing are common names for how many companies are independently getting volume work done for their products. With these and others like them, we have half of the WorkExchange equation. The equally important second half is the management of work through to completion. Today, overly complex project tools like MS Project, as well as simple task lists housed in spreadsheets, email, wikis, blogs, and file sharing sites are the first generation tools for this job. What will come to the forefront are tools which depart from the forced project management structure and process that has been the impediment to successful project management technology for the past 20 years. The new era of tools will let people create teams in an unlimited number of combinations, and will not define the team as something within one organization. They will take the virtual workers into account. When this technology evolves, we will get closer to a true WorkExchange that has the potential to bring work and workers together in a single, networked platform. In order for this to gain the attention of the mainstream (as both work and workers are required to make it succeed) the macro-economic environment must make efficiency and productivity of the utmost importance. A perfect storm of economic turmoil and global competition in products and services continues to drive business down the most efficient, most profitable and most growth oriented avenues. That efficiency is increasingly coming via the fracturing of integrated companies into specialty service firms and contractors. Today, any size firm can spec out the deliverables and hand them off to specialists who are paid on their ability to perform and deliver according to those specifications. They’re simply paying for the results they’ve spec’d out. This process saves the small business the overhead of a full-time employee, but gives them assurances that the deliverable will be completed. In the U.S. we are increasingly a knowledge worker economy, which lends itself perfectly to digitizing deliverables. This digitization will greatly benefit small businesses and individual contractors as more and more opportunities will be available to productive workers to create their own businesses. Today, 75% of job growth in the U.S. comes from small business, and that percentage is likely to increase as technology enables easy access to work from anywhere. As businesses continue to lower fixed costs and the technologies mature, the true WorkExchange will have the perfect environment to flourish giving humans a whole new avenue in which to work.